Space Required: 1.5 m.(L)x 1.0 m(W) table top. 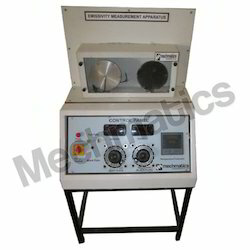 We are offering for Emissivity Measurement Apparatus. To furnish the diverse requirements of our clients in the best possible manner we are involved in offering an extensive range of Emissivity Measurement Apparatus. Advanced technocracy inc. Is preparer, & of emissivity measurement apparatus. Floor Space Area: 1.5m x 1 m.
The unit consists a test plate and a black plate, as a comparator, all the physical properties, dimensions, & temp. are equal, heat losses from the both plates are same except radiation losses. Input difference will be due to difference in emissivity. Input given through separate dimmer so temp. of both can be kept equal. 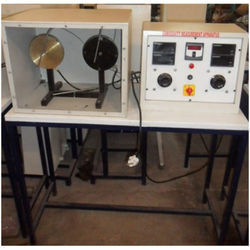 To determine emissivity of test plate. To Observe & calculate The radiant energy per unit time area from the surface of the test body at various temperature.